nikakihijau: Career Fair in UTM Skudai Malaysia. 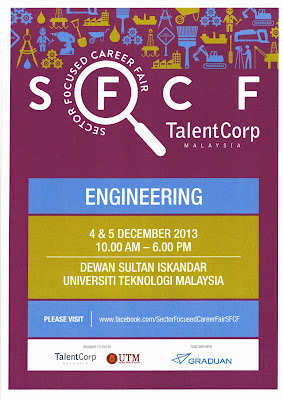 Venue: Dewan Sultan Iskandar, UTM Skudai, Johor. Power Industry: Track 3A and 3B project, Combined Cycle Gas Turbine and Coal Fired Power Plant project, Hydroproject in Sabah, etc. Oil and Gas industry: Kikeh Deepwater Project, Malikai Tension Leg Platform project Sabah Shell Petroleum, etc. Oil and Gas players like Schlumberger, Weatherford, Baker Hughes, Shell as well as Power Companies like Malakoff, TNB, etc will definitely be there to entice fresh graduates to join their organization. Furthermore, please take note that UTM is the only university that has the SPIE (Society of Petroleum Engineers) Malaysian chapter organization. Hope the fresh grads out there will make the right choice for their own career development.